Rihanna was spotted at Giorgio Baldi on August 12, 2012 wearing a leather cap and shorts with a printed t-shirt from FreshJive. 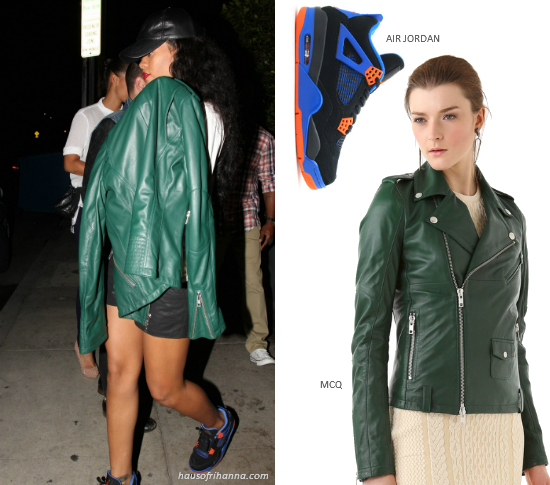 Rih pulled out yet another pair of Air Jordan sneakers, this time donning the Cavs version of the Retro 4. She covered up with a green leather motorcycle jacket from McQ by Alexander McQueen. The jacket costs more than $2000 and is available at Shopbop.